Where has the time gone?! It seems just like yesterday that I was a studious sixth-grader (yes, that’s me to the left) successfully navigating the rigors of academia at Loller Middle School, the first of the Hatboro-Horsham school district’s two middle schools (6th-7th grades; 8th-9th grades). 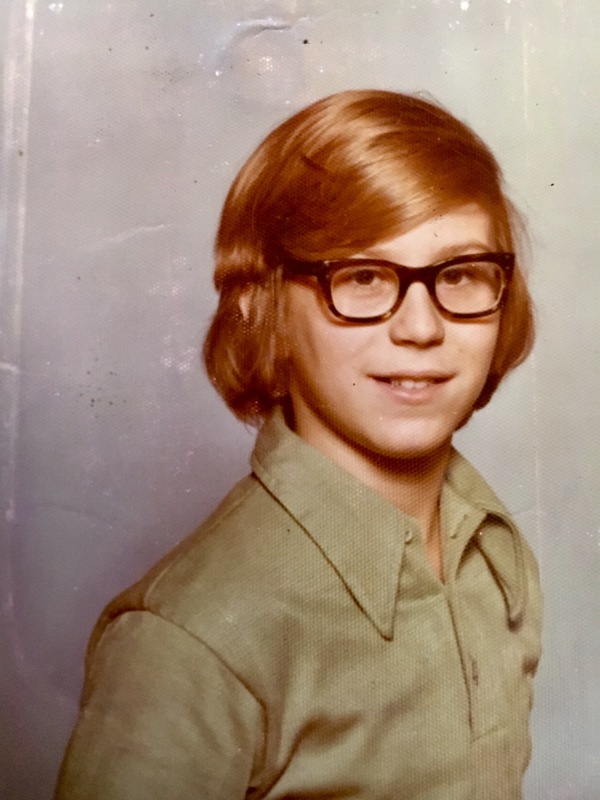 I was on my way to achieving the Honor Roll yet again on this day 40 years ago, and would continue to do so until 8th or 9th grade, when I ran into problems with math. X plus Y equals what?! According to my old report card, my homeroom teacher was Miss Goldeman – but, sad to say, I have no memories of her beyond a vague feeling that she may have been an art teacher. In fact, I have few in-school memories of any kind from that spring. I do remember a fire drill that found us kids lined up outside on a dreary day for what seemed like forever, but it could well have been the previous fall or sometime during the next school year; regardless, it turned out that it wasn’t a fire drill but a locker search. (The only thing they would have found in mine: gum.) I watched far too much TV, and read and collected pro wrestling magazines. One book that I read around this time: The Eagle Has Landed by Jack Higgins, about a Nazi plot to kidnap Winston Churchill. I remember that because I decided I wanted to read it after seeing the film of the same name, which was released in the States on April 2nd. In the wider world: Jimmy Carter was president. Unemployment was high at 7.2 percent, but on a downward slope; and inflation was unseemly, too, at 7.0 percent. No president deserves acclaim or blame for the economy three months into their first term, of course; their policies have yet to be implemented, and even if they have, it takes time for those changes to reverberate beyond the bureaucracy. So I’ll save my criticisms of Carter for another day. As I write, the temperature outside is 69.6 degrees, the sun is out and few clouds dot the blue, blue sky. It’s a beautiful day. This day in 1977, a Saturday, wasn’t quite as nice: though the sun was out, the high peaked at a mere 48 degrees. The low was 25. We likely visited one or both sets of grandparents, or the great-aunts & uncle, as that’s what we did most weekends. In the sports world, the Flyers, who racked up a 48-16-16 record during the regular season, were two days away from beginning their first-round playoff series against the Toronto Maple Leafs. They’d lose the first two games before winning four straight, but were then swept in the next round by the Boston Bruins. The 76ers, in the penultimate game of their season, defeated the Washington Bullets 125-93, improving their record to 50-31; they’d make their way to the NBA Finals—and lose to the Portland Trailblazers. The other team in town, the Phillies, began their season with a 4-3 lose to the Montreal Expos. 1) Abba – “Dancing Queen.” Debuting at No 1 is this dollop of unadulterated pop, which some folks hate with a passion. Not me, though. It never fails to put me in a good mood. 2) David Soul – “Don’t Give Up On Us.” The No. 2 song of the week is this kitschy number from the actor better known as Richard “Hutch” Hutchinson on Starsky & Hutch. Along with Charlie Rich’s “The Most Beautiful Girl in the World,” it was often a featured song on TV commercials for love-themed compilation LPs during the late ‘70s. 3) Thelma Houston – “Don’t Leave Me This Way.” Clocking in at No. 3: this disco tune from Ms. Houston, which would top out at No. 1 in a few weeks and earn her a Grammy for Best Female R&B Performance. 4) Hall & Oates – “Rich Girl.” Falling from No. 1 to No. 4 is this classic from the blue-eyed soul duo, who met while students at Temple University in Philadelphia in 1967. 5) Glen Campbell – “Southern Nights.” Years ago, in my TV GUIDE days, I interviewed Campbell (via phone) for a Nashville Network special that he was in – and he was nothing but nice. Super nice, actually. He even sang snippets of different songs to me, including Bob Dylan’s “Lay, Lady, Lay.” Of this song, this week it jumped from No. 9 to No. 5 and was on its way to No. 1. 6) The Steve Miller Band – “Fly Like an Eagle.” I don’t believe I ever bought anything by Steve Miller. I never felt the need. Not because his songs weren’t catchy or good, but because they were played so often on Philly radio stations that I came to know them like the back of my hand. Of this song: Having already hit No. 2 a month a change earlier, this week it held steady at No. 13 for a second week. 7) Rod Stewart – “The First Cut Is the Deepest.” The No. 22 song this week is this classic, which many folks, nowadays, consider a Sheryl Crow song. And while I love her version, I can’t help but to shriek a little inside when she’s credited for the Cat Stevens-penned tune, which was a U.K. hit for P.P. Arnold in 1967 and, a decade later, a sizable hit for Rod Stewart in the U.S.